Have you ever tried to cut sugar out of your diet? It’s almost impossible. The stuff is in everything. In fact, the average American consumes roughly 15 teaspoons of added sugar per day — and often without even realizing it. In addition to things you already know about, pickles, pasta, salsa, beer, granola, baked beans, and tomato sauce all have added sugar. Well, that’s what marijuana is going to be like. Pretty soon, some form of pot — whether it be cannabis or CBD oil — is going to be in almost everything you consume. It’s the new additive du jour. And that’s why major food and beverage companies are rushing to take huge stakes in marijuana companies. Predictably, beer companies have been the first to dive in. Constellation Brands, which makes Corona beer, has taken a $4.2 billion stake in Canopy Growth. Those two companies are now developing an array of non-alcoholic, cannabis-based drinks. 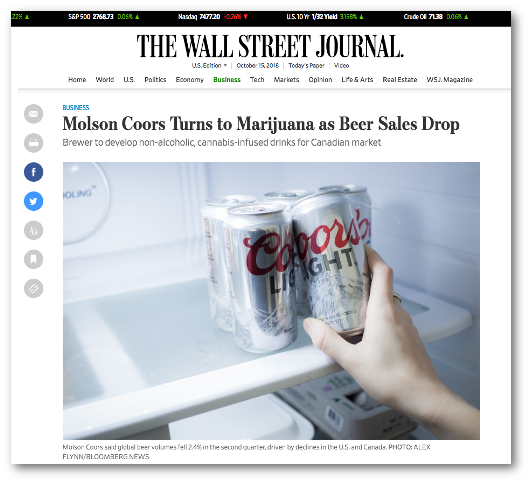 Molson Coors has a joint venture with cannabis producer The Hydropothecary Corporation, that aims to do the exact same thing. Adolphus Busch V, one of the heirs to the massive Anheuser-Busch fortune, is launching his own pot company. And last June, Heineken's craft subsidiary, Lagunitas Brewing Co., launched a THC-infused cannabis sparkling water, Hi-Fi Hops, with two variants — one with 10mg of THC and one with 5mg of THC and 5mg of CBD. Again, this makes sense, since alcohol will be the first industry marijuana undermines. But it won’t be the last. 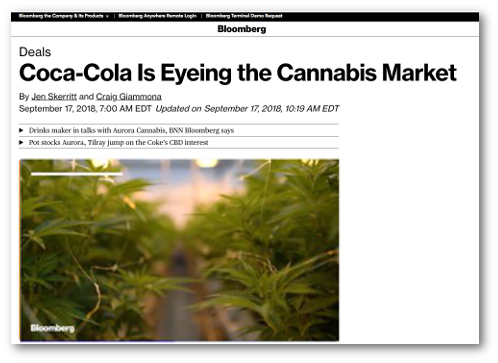 And that’s why Coca-Cola and Pepsi are exploring cannabis options of their own. No doubt, soda companies have been coping with sales declines as consumers turn to healthier alternatives. CBD oil, which has known health benefits, could help there. This wouldn’t be entirely new territory for Coca-Cola, either. The drink, named for the coca leaf, once contained roughly nine milligrams of cocaine per glass. Pepsi is doing the same thing. “I think we'll look at it critically, but I'm not prepared to share any plans that we may have in the space right now,” Chief Financial Officer Hugh Johnston told CNBC. They’ll need to move fast, if they’re going to stave off challengers. Recess, a CBD-infused sparkling water company, is already out there competing with Perrier and La Croix. Another company, Dirty Lemon, combines fruit juices with CBD to produce a “mild euphoria.” Its first production run of 12,000 bottles sold out in just two days. Like I said, marijuana is the new sugar. And that means candy companies need to watch out, too, because there’s a wide range of edibles ready to share shelf space with Hershey, Reese's, and Snickers in the checkout aisle of your local grocery store. But unlike sugar, these marijuana and CBD-infused products will also go in facial creams and body lotions. Such products are already being endorsed by the likes of Kathy Ireland and Meryl Streep. This is why the North American cannabis industry is set to grow from $9.2 billion today to a massive $47.3 billion in the years ahead. I’m sure joints and bongs will always have their place, but marijuana isn’t going to generate its biggest profits from smokers. It’s going to be people who use discreet, unintrusive products. That report details five marijuana companies that are likely takeover targets. These companies are in for the same kind of cash infusion that Canopy got from Constellation Brands. So, join Outsider Club today for FREE! You'll learn how to take control of your finances, manage your own investments, and beat “the system” on your own terms. Become a member today, and get our latest FREE report: “Three Big Profit Opportunities in Solar”!